I thought I had found THE ONE. Reliable, welcoming, firm yet tender all at the same time. After years of searching, countless sleepless, tear-filled nights were finally over as I had found my perfect match. No Mum, don't get excited I had't got engaged to Mr Darcy look alike 6ft 2, rich-handsome-is-kind-to-animals, Architect. Some might argue I'd done even better by finding my ideal pillow! Yes, I had found the Holy Grail of pillows. For migraineurs this can be a never ending Quest. And I had been searching for roughly 5 years until an Osteopath told me about the Tempur Traditional Pillow. It's shaped like a normal pillow - but filled with that magic Tempur stuff. Does anyone even really know what Tempur is? All I ever remember from the TV ads is that is it 'Space Endorsed by Nasa' and I would get really confused thinking Tempur is what you baste prawns in? But that's Tempura, in case anyone's as confused as moi. Anyway.... I purchased said pillow and was amazed. Unlike the 3,000 other pillows I'd purchased this one was all I'd ever dreamed of. I'd been warned of the dangers of purchasing the wrong pillow. Every Osteopath, Physiotherapist, Alexander Technique person I've ever seen had said that supposed 'neck pillows' can often do as much damage as good. Those rock hard solid ones, which feel like your head is lying on a lump of concrete, can be quite hazardous. But conversely, I've woken up with neck sprains from sleeping with paper thin, non-existent feather pillows, which has then triggered a migraine. Obviously it's incredibly individual but there are some basic guidelines which the fabulous Kerrie outlines beautifully in the following article. I would just add a note of warning, sleeping on your stomach, on your front, is evil. Don't do this - you are twisting your spine in ways not intended by nature. I knew one Chiropracteur who made his patients sleep with tennis balls in their top Pajama pockets, just to get them to stop sleeping on their stomachs. But back to my pillow saga, so I had finally found my perfect pillow mate and we were happily settled in slumber bliss. But, like all good domestic arrangements, things started to go awry. I started to wake up with little bits of Tempur Space endorsed fluff in my hair. It had actually got through my pillow case into my hair. My beloved was letting me down, crumbling before my eyes. Finally, Mum made me see it was time to let go, move on, and buy a new model. With a heavy heart I threw my love into the trash, vowing never to forget the time we spent together, but I walked into a specialist store and purchased a Mr Perfect Pillow II. Immediately, I knew something was wrong. Despite the fact that the price tag nearly melted my credit card, this pillow seemed to be twice the size and twice as heavy. I told myself I was imagining things but that night as I lay down to sleep, my fears were realised. It was like lying on a brick. I wept. But I was so determined that this was still THE ONE that I stubbornly slept on it for two more nights, despite the fact I couldn't really move my head the next morning. It really wasn't me. It was him, I mean it. So I decided to slice open this pillow and pull out some of this Tempur stuff. By the way, this is not actually the first time I've performed open pillow heart surgery. I may have pulled out the stuffing of a pillow in a Hotel in Egypt, shoved it in a drawer - then pushed it back in and sewed the pillow back up at the end of my stay! Needs must my friends. But I have been on holidays where I've woken up every night with a migraine at 4am and the trigger has been 'dodgy' pillows. While we're on the topic of Hotel's - can I just say that I highly commend The Penny Hill Park Hotel for their pillow menu. I recommend all migraineurs stay in Hotels with pillow menus if you can't take your pillow mate with you. This also means you're less likely to be a pillow vandal! A couple of months ago I went to Penny Hill Park with a friend, and was over-joyed at the pillow options available to me. I tried one of everything, as did my friend, Salvatore. Indeed, Salvatore was so taken with the V shaped pillow that he purchased one the very next day. Here he is below, happily enjoying a snooze on his V pillow. But back in the real world, without a pillow menu at home, I was distraught. I had decimated my Tempur pillow, even withouth half its contents it was still a veritable brick. 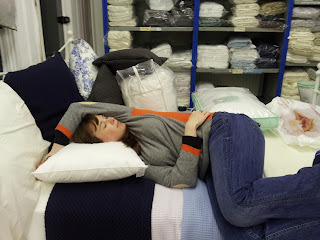 My poor Mum let me test out each of her pillows but nothing was comfortable. I'm sure the needs of my dodgy neck are changing but surely, I wailed, it couldn't be so hard to find a soft yet firm, but not so firm supportive pillow! So on Tuesday, Mum kindly drove me to a Hotel outlet supplier shop. Pillow mecca. I think they were rather disappointed that we were just looking for one pillow, not the 300 hundred I'm sure they're used to selling, but they graciously let me lie on their sample bed and test out a plethora of pillows. And lo and behold I think I may have found it. Firm, yet fluffy and supportive. As Mum and I approached the check out counter I began to dread the amount this precious cargo would cost. I'm pleased to report I woke up migraine free this morning. God bless 100% Polyester. Please tell me you took the tempur pillow back to them and told them to stuff it. I have the mattress and couldn't believe the instructions with it. I didn't buy the matching pillow, agonised over the mattress protector that was 10 times the price of any other, but the only I was allowed to use and I die every night without my hotwater bottle (lose the guarantee). So give it back to them, please, and kick up a BIG stink. Nasa rotters. (But yes, they are very comfortable! i bought a tempur pillow and it was hell to sleep on! took it back ang got my money refunded!! I'll drop you an email now. I bought a big square pillow with a hole in the middle not so long again to try and help my migraines. Not only did it make them worse, but apparently, so my wife says, it made me snore really loudly. I have settled with a cheap, flat £3 pillow and £5 feather pillow from the local "cheap-o-cheapie" shop which raise my head to just the right hight. First thing, £109 for a pillow? The world's gone mad. I hate pillows, I use none or the flattest one I can find. Drives my mum nuts cos my bed doesn't look right, but the alternative was finding them on the floor every morning. 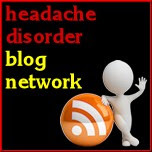 I've been reading your blog for a while now and as a sufferer of Chronic Migraine myself it is good to know that others out there know what putting up with this awful condition is like as it can be very lonely at times feeling nobody understands! At the moment I get around 15 - 18 migraine days a month and am currently seeing a neurologist trying to find a preventative that works, no luck so far but I still have hope! I have also been on ESA in the Support group for the past year although it has been a struggle to win this benefit even though the Job Centre told me I was unemployable due to the severity and frequency of my migraine attacks. As it is coming up the end of the year and thinking about the future (as you do) it is hard not to feel anxious and down about what lies ahead. Having such poor prospects for holding down a "normal job" and yet the DWP itching to get me off ESA regardless of my actual situation. My neurologist has already advised that if not working helps me control my migraine better than I should not work but of couse it is not as simple as that. I have been thinking of some kind of self employment. I do have some skills which could perhaps be used to work part time from home which would help me to manage attacks but as I would be unlikely to make much money I would need some kind of assistance at least initially but I can't make head nor tail of the way the benefits system works or how this will be affected by the Universal Credit when it comes in. I believe many people deal with an inability to hold a conventional job by doing crafts and such from home but they do get some top up benefits do you know of any group or website that gives advice on this sort of thing or perhaps any of your readers? I did approch my local citizens advice but they were too busy to see me, I will try again next year. Hope you and all your readers have a wonderful, migraine free Christmas! P.S. I found my Perfect Pillow for 6 pounds at Morrisons, I doubt he will last long but he is my "Mr Right Now (pillow)" if you’ll excuse me riffing on your post! I am in a similar situation. Two things - it is very VERY hard to make a real living from home, but there are rules about working which could mean you keep your benefit - if you work self employed for under 16 hours a week. For me 16 hours sounds like a LOT. And then there's working tax credit - which looks to me a bit of a minefield, but if you are realistic about how much you can work and how many hours and how often then there might be an appropriate level of assistance out there for you. Three things. The other thing is pacing. You really must take pacing seriously if you are going to do activities that you wouldn't normally do. Good luck, I, too, am looking for a way out of the benefit hell. Regarding pillows... my struggle just goes on and on. One day... one day. HI Betty! Sorry not to get back to you sooner and thank you for reading and getting in touch! Well the fabulous Elaine speaks much sense as usual. Those who craft at home, usually live with a partner who help contribute - and, from what I can gather - have other jobs too - things are never what they seem! But it's a really good and positive place to start if that is something that you're interesting in - starting up a crafts business - freelance/creative work does seem to suit us migraineurs well. As Elaine says, if you're on ESA you can't work more than 16 hours a week and make more than a certain amount otherwise you lose it. Your local Job Centre rep should be able to explain it all - and if you ring up the ESA helpline they normally can tell you what other benefits you re entitles too - and keep pestering your CAB. I'd also give Hannah, the Advocacy and Policy Manager at the Migraine Trust a ring - it's a free service and whilst she can't give detailed and personal advice on individual benefits claims etc - she might have some words of wisdom or ideas about where else to go for help. She's really lovely and helpful, her direct line is on their website. Hope that makes some sense! Victoria & Elaine, thank you both so much for your replies. 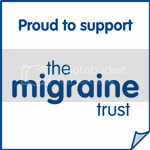 I will need to follow up on all these things you both suggest and I will contact Hannah at the Migraine Trust. I am worried that what I hoped I would be able to do won't be possible once the new Universal Credit comes it but I believe it may take a few years to all come into place so perhaps I am just best to go for it now! Thank you again for your encouragement and advice! Victoria, hope your pilliow at least sees you though Christmas pain free!